The Meaning of Hap Ki Do is a way (art) of harmony and Ki ( inner strength;both physical and mental ) based on the Um(yin) Yang(yang) Theory. Hap Ki Do movement is based on soft circle and flowing water theories instead of linear reaction to bring the rigid movements against opponents. It uses yielding, absorbing and redirecting motions to control opponents using their forces instead of your own. Hap Ki Do originated in Korea and is one of worlds most powerful, useful and unique Martial Art ever in modern history. It was developed during Silla dynasty (B.C. 57 – A.D. 935) before the dynasty united 3 kingdoms in the Korean peninsula. Hap Ki Do was military tactics developed for noble family’s young men to fight against enemy troops. Today’s Hap Ki Do has some influence from Japanese Aki Jujitsu. From 1910-1945 Japan occupied Korea and did not allow them to practice any martial arts. However, Hap Ki Do remained active in Japan under Aki Jujitsu, which had influence from Silla dynasty. 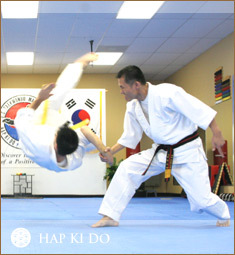 Hap Ki Do was brought back into Korea by Grandmaster Young Sool Choi. He lived in Japan with the founder of Aki Jujitsu under the Takeda house. While there Grandmaster Choi had the chance to learn Aki Jujitsu and was one of the best among Takeda’s students. In 1945, after Korea liberated from Japanese colonial state Grandmaster Choi came back to Korea following his teacher Takeda’s will. There he started to teach martial arts at Tae Ku (South east region of Korea’s city), and then Grandmaster Han Jae Ji joined. Grandmaster Ji was one of the few early members of Grandmaster Choi’s students. Later on Grandmaster Ji formalized Hap Ki Do as it is today, including officially creating the name of Hap Ki Do in 1957( Hap Ki Do Sung Moo Kwan opened by Dojunim Ji, Han Jae ). Hap Ki Do is for ages thirteen and up, men and women, but mostly for the serious and focused Martial Art Students only. The training of Hap Ki Do provides adults with the opportunity to learn close contact self defense, such as grappling, unlocking and locking the joints, throws and how to control weapon attacks. Young adults will improve focus, balance, coordination, flexibility and learn many self-defense techniques against assaults and even kidnapping. Hap Ki Do has many special and unique techniques to apply and control the opponents without using any major efforts oneself. There are many military Special Forces, Secret Service members and law enforcement officers who consider Hap Ki Do to be the best choice of self-defense training in the world. The ability to defend oneself in today’s society is invaluable, but to be able to do it with a high level of skill, and minimal confrontation time, is advantageous to any adult. Learning Hap Ki Do will improve all aspects of well being, as well as sharpening the mind and body. It is a great way to test your limits and push them to the max. Finally, Sabom nim’s (Grandmaster Kim’s) Philosophy of Martial Arts is quite unique from many others out there. Once you join, you will truly discover what it means to practice Hap Ki Do. Grandmaster Kim was greatly honored to have had the chance to learn Hap Ki Do from the father of Hap Ki Do, Great Grandmaster Dojunim Han Jae Ji. Grandmaster Ji had great influence on Martial Arts legend Bruce Lee in late 1960’s and early 1970’s. Bruce Lee personally trained in Hap Ki Do with Great Grandmaster Ji at Andrews Airforce-base,they had built a relationship by Grandmaster Joon Rhee’s introduction. and Lee showed his appreciation by inviting him to Hong Kong and cast him in his last movie “The Game of Death”. Grandmaster Kim teaches Hap Ki Do based on what he learned, especially the philosophy and attitude. Belt advancement is achieved when students demonstrate substantial efforts in every category of training. There are no formal tests for students until the Black Belt test. If anyone is interested in learning Hap Ki Do, make sure to inquire about a trial lesson. If you find that after you take the trial lesson it is something you will benefit from, then you may have a chance to join. In order to be welcomed in the Hap Ki Do brotherhood, an individual’s attitude must be exceptional. As an ancient Chinese scholar said “a thousand mile journey starts with one small step.” Through patience and dedication you will receive great benefits from Hap Ki Do.